Note that he is the father of William Lawrence Bragg. There was no PhD in Cambridge until 1919, and J.J. Thompson was in fact his Master's advisor. Sir William Henry Bragg (July 2, 1862 – March 10, 1942) was an English physicist who, independently and in partnership with his son, William Lawrence Bragg, pioneered the use of X-rays to determine the atomic structure of crystalline substances. For their contributions, father and son jointly received the Nobel Prize in Physics in 1915. The techniques he and others developed were later used to investigate the structure of the DNA molecule. Bragg was the eldest child of Robert John Bragg, a sea captain who had become a farmer after receiving an inheritance, and his wife Mary Wood, daughter of a clergyman. Bragg was born at Westward near Wigton, Cumberland. Bragg's mother died in 1869, and Bragg was taken in and educated by his father's brothers. He later attended King William's College, Isle of Man, where he took an interest in sports and a variety of extracurricular activities on campus besides his formal studies. He won a scholarship to Trinity College, Cambridge, entered Trinity in 1881, and graduated in 1884 as third wrangler in the mathematical tripos. Upon the implicit recommendation of J.J. Thompson, one of his instructors, Bragg won an appointment as the "Elder Professor of Pure and Applied Mathematics at the University of Adelaide in Australia and began his duties there early in 1886. He then had what he considered a limited knowledge of physics, but there were only about a hundred students doing full courses at Adelaide of whom scarcely more than a handful belonged to the science school. Bragg married Gwendolyn Todd, the daughter of Charles Todd, an astronomer and friend of Bragg's. In 1890, a son, William Lawrence Bragg, was born, and another, Robert, soon after. While Bragg's intense teaching schedule prevented him from conducting research, he retained a keen interest in the developments of physics, and read periodicals and papers. In 1896, only a year after Wilhelm Roentgen discovered X-rays, Bragg rigged up an X-ray machine of his own to examine his son's broken elbow. This event is said to have been the first use of X-rays as a diagnostic tool in Australia. Bragg then conducted a series of well-attended lectures on X-rays, and established the first wireless telegraphy system in Australia in 1897. That same year, he took a two-year sabbatical, spending the time visiting relatives in England and touring the continent and northern Africa with his family. In 1803, Bragg assumed the presidency of the Australian Association for the Advancement of Science. At the organization's annual meeting in 1904, convened in New Zealand, Bragg delivered an address on "Some Recent Advances in the Theory of the Ionization of Gases." This paper was the origin of his first book Studies in Radioactivity, published in 1912. Shortly after the delivery of his 1904 address some radium bromide was placed at the disposal of Bragg with which he was able to experiment. In December 1904, a paper by him "On the Absorption of a Rays and on the Classification of the a Rays from Radium" appeared in the Philosophical Magazine, and in the same number a paper "On the Ionization Curves of Radium," written in collaboration with Richard Kleeman, also appeared. these papers established that there were several types of alpha particles, that their absorption increased with the atomic weight of the material used as a barrier or target, and that absorption dropped off steeply at a particular distance rather than exponentially as in the electron. These papers earned him an international reputation and won him membership in the Royal Society of London in 1907. Among his sponsors for membership were J.J. Thompson, Ernest Rutherford, and C.T.R. Wilson. Also in this year, Bragg's wife gave birth to their third child, Gwendolen. At the end of 1908 Bragg resigned his professorship at Adelaide to assume the Cavendish Chair of Physics at Leeds University. During his 23 years in Australia, he had seen the number of students at Adelaide University nearly quadrupled, and had had a full share in the development of its excellent science school. Around this time, Bragg argued on behalf of the particle nature of X-rays. Bragg argued that X-rays retain their momentum far more than one would expect for electromagnetic waves, which spread out and weaken with distance. He later accepted evidence, supplied experimentally by Max von Laue and based on the detection of interference patterns made by X-rays passing through crystals, that X-rays are electromagnetic waves. But in a prophetic remark that would only be borne out 15 years later with the formulation of quantum mechanics, Bragg said that the problem was "not to decide between two theories of X-rays (wave or corpuscular), but to find, as I have said elsewhere, one theory which possesses the capacity of both" (Gonzalo and Lopez, 2003; 15). Max von Laue had shown that X-rays are scattered when they pass through a crystal in much the same way as light does when it passes through two closely spaced slits. This demonstrated the electromagnetic nature of X-rays. But some of the scattering could not be explained on the basis of Laue's analysis. Bragg's son, William Lawrence Bragg, was able to explain the patterns produced by the X-rays, and to clarify the atomic structure of the crystals through which they passed. Bragg himself found a way to generate X-rays of a single wavelength, and invented the X-ray spectrometer. He was joined by his son at Leeds for a time, where they went on to establish the new science of X-ray analysis of crystal structure. Through X-ray analysis, they confirmed the earlier findings of J.H. van 't Hoff on the spatial distribution of the bonds of the carbon atom through analysis of the crystal structure of diamond. In 1915, father and son were jointly awarded the Nobel Prize in Physics for independent and joint contributions to the analysis of the atomic structure of crystals, using the X-ray spectrometer and theoretical investigation. Their volume, X-Rays and Crystal Structure, went through five editions in ten years. Laue won the Nobel prize for his research in 1914. Bragg was appointed Quain professor of physics at University College London in 1915 but did not take up his duties there until after World War I. He did much work for the government at this time, largely connected with submarine detection through the improvement of the hydrophone, at Aberdour on Forth and at Harwich. He returned to London in 1918 as consultant to the admiralty. While Quain professor at London he continued his work on crystal analysis. From 1923, he was Fullerian professor of chemistry at the Royal Institution and director of the Davy Faraday Research Laboratory. Bragg quickly gathered around him a group of competent researchers who later made important contributions to the field of X-ray crystallography. He also purchased a country home where members of the staff could socialize informally on weekends. The laboratory was practically rebuilt in 1929-1930 and under Bragg's directorship many valuable papers were issued, mostly dealing with the investigation of organic compounds using X-ray diffraction methods. Bragg at this time was fond of delivering lectures on scientific subjects to a general audience, and infused his talks with simple yet profound reflections on the state of science in his time. In the 1930s, he continued to be involved in research, and in his last years, from 1939 to 1942, wrote a series of papers to explain anomalies in the X-ray analysis of crystals, attributing them to imperfections in the crystal structure. One of these papers was published posthumously. Bragg died on March 12, 1942, after meeting with his son in what seemed like a normal day at the Royal Institution. 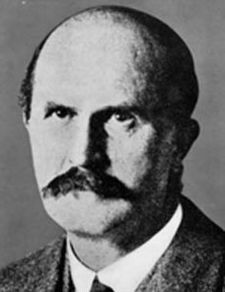 Bragg was already an accomplished physicist with an established reputation before he and his son, William Lawrence Bragg, embarked on the investigations that would win them enduring fame and a Nobel prize. Bragg's success could have easily overwhelmed that of his son, but the two managed to work out their personal differences and work together productively. Bragg did not conduct important research until he was in his 1940s, in contrast to his son, whose independent accomplishments at the age of 22 made him the youngest Nobel prize winner. The work of the two demonstrates how there is no hard and fast rule to the manner in which scientists make an enduring contribution. Bragg's work and that of his son paved the way for deciphering the structure of complex organic molecules, leading to the unraveling of the structure of the DNA molecule in the early 1950s. Bragg became a Fellow of the Royal Society in 1907, was elected a vice-president in 1920, and served as president of the society from 1935 to 1940. The lecture theatre of King William's College is named in his memory. Since 1992, the Australian Institute of Physics has awarded the Bragg Gold Medal for Excellence in Physics for the best PhD thesis by a student at an Australian university. In 1889, he married Gwendoline Todd, daughter of Sir Charles Todd, who died in 1929. He was survived by a daughter and his son, Sir William Lawrence Bragg, another son, Robert, died at Gallipoli. Bragg was knighted in 1920, and in the same year was made honorary fellow at Trinity College. In 1931, he was given the Order of Merit. William Henry Bragg, The Crystalline State - The Romanes Lecture for 1925. Oxford, 1925. Serle, Percival. 1949. "Bragg, Sir William Henry (1862-1942)" in Dictionary of Australian Biography. Sydney: Angus and Robertson. Retrieved May 1, 2007. This article incorporates text from the 1949 edition of Dictionary of Australian Biography from Project Gutenberg of Australia, which is in the public domain in Australia and the United States of America. History of "William Henry Bragg"
This page was last modified on 2 April 2008, at 03:40.